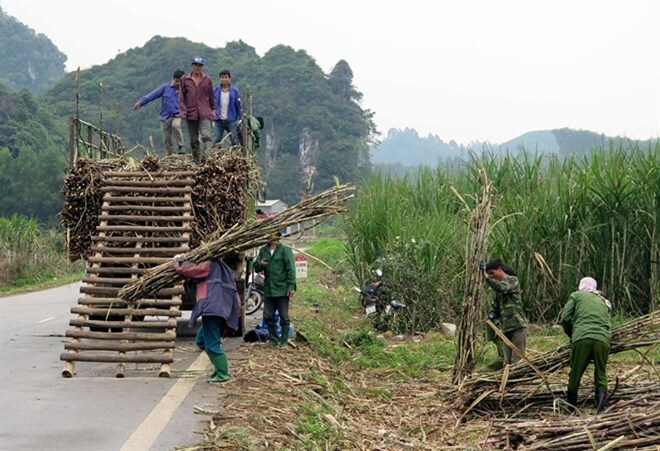 Hanoi (VNA) - Five years after staying silent in the market, sugar stocks rose with high liquidity, thanks to better sales from local firms and higher demand in the world market. According to the market data, sugar stocks were recording their best results for five years. In particular, shares of Son La Sugar JSC (SLS) on June 28 rose 406 percent over last year’s level to reach 117,900 VND (5.3 USD) on the northern bourse. Shares of Kon Tum Sugar Joint Stock Company (KTS) also increased nearly four-fold from last year to reach 63,900 VND each yesterday on the southern bourse. At the same time, shares of Thanh Cong Tay Ninh JSC (SBT) rose 141 percent, shares of Lam Sơn Sugar Joint Stock Corporation grew by 73.5 percent, and shares of Bien Hoa Sugar Joint Stock Company (BHS) shot up 43.18 percent. The rise in those stocks was due to better results of leading local sugar manufacturers in the first quarter of this year. The total sales of the five big firms reached nearly 34 trillion VND, an increase of 80 percent over the same period last year. Their gross profit also reached 470 billion VND, up 89 percent. In the first quarter, SBT reached total sales of 1.24 trillion VND, 2.2 times higher than in the same period last year, thanks to the merger with Gia Lai Sugar JSC (SEC) last year. Similarly, BHS recorded sales of nearly 1.2 trillion VND, up 55 percent thanks to the merger with Ninh Hoa Sugar (NHS). Meanwhile, Q1’s sales of LSS, KTS and SLS, also rose 104 percent, 103 percent and 29 percent, respectively, in the first quarter. Also, due to higher prices and lower costs of production, all the companies registered much better profits in Q1. According to local securities experts, the global prospect, after world sugar prices notched up an impressive record this year, will be a boost for local sugar firms. The sugar futures contracts on the intercontinental exchange floor recorded a 23-year high in February due to lower production caused by El Nino globally. According to the industry outlook report from Vietcombank Securities Company (VCBS), there is a shortfall of 3.5 million tonnes of sugar in 2016 after five years of surpluses. Nguyen Ngoc Thach, head of the brokerage section Saigon Securities Inc, said domestic drought conditions reduced Vietnam sugar production to 15.9 percent or 1.59 million tonnes, however, the shortage raised domestic sugar prices by 35.6 percent from 2015. Thach said the price would go up during 2016 and 2017 and benefit local firms. However, experts also noted that under the trans-Pacific Partnership Agreement (TPP), sugar firms were among those who benefitted the least. While TPP fetched great benefits to other industries such as textile and seafood, sugar producers were seen to face serious challenges because of the fierce competitiveness of TTP members. While TPP rival Australia was the world’s third largest sugar exporter and could produce a tonne of sugar at about 20 USD, Vietnam, one of the least productive sugar manufacturers, could produce a tonne of sugar at between 55 USD and 60 USD. VCBS said Vietnam must face up to the stiff competition in the next three years, so local firms should stabilise and expand the cultivated area as well as enhance productivity and output to join the game.